That is an all-encompassing list of ALL Android-devices (currently numbering 2414). Before publishing your app on the Store you have to manually check/uncheck whether each of these is supported or not. After all, any of these devices can access the GooglePlay-store (as far I can tell), and following that, any would be able to download your game. Due to the sheer number of devices, testing all of them is ridiculously infeasible. Hell, even going through the list is infeasible. There MUST be a better way. Like “filter all devices without this feature”. That sounds doable. 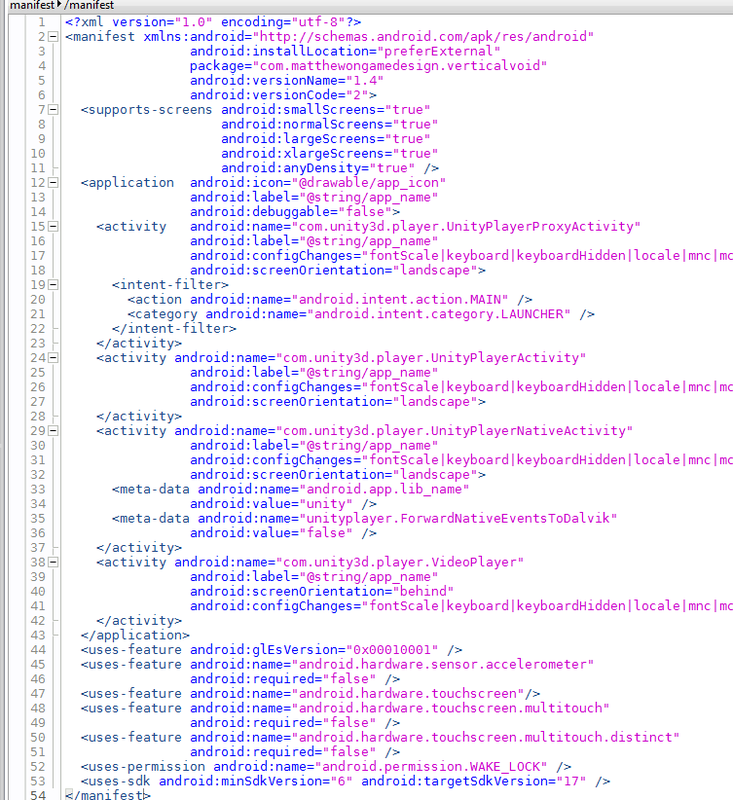 So while researching a workaround I stumbled upon the Android-Manifest-File. This magical document lets you specify certain requirements of your app, like “Only run of devices with a camera”, or “only run on devices with an Accelerometer”. That’s sounds perfect. …but unfortunately there was no documentation on how to use it with Unity. Where do I put that file? How does it look like? Where do I find it, assuming it is already present somewhere? No encompassing documentation is available for this problem. So I decided to write my own. 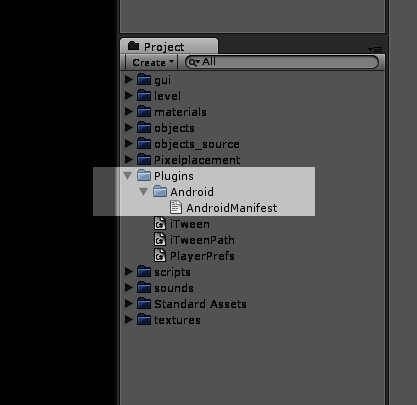 Luckily Unity creates a Manifest-File automatically. Go to the folder YourUnityProject/Temp/StagingArea. You will a file named “AndroidManifest.xml”. This is the one we are looking for. Near the end of the file, after the /application-tag, are the lines that specify which features are required by the app. Find them. All the “hardware” features of your app are automatically listed in the manifest-file near the end. By adding android:required=”true” you make sure that only devices with this features can download and install this app. If you add android:required=”false” on the other hand, devices without said feature can access it anyway (but get a warning that the app would access it, if it could). This is useful for apps where motion-controls (for example) are available, but not required. 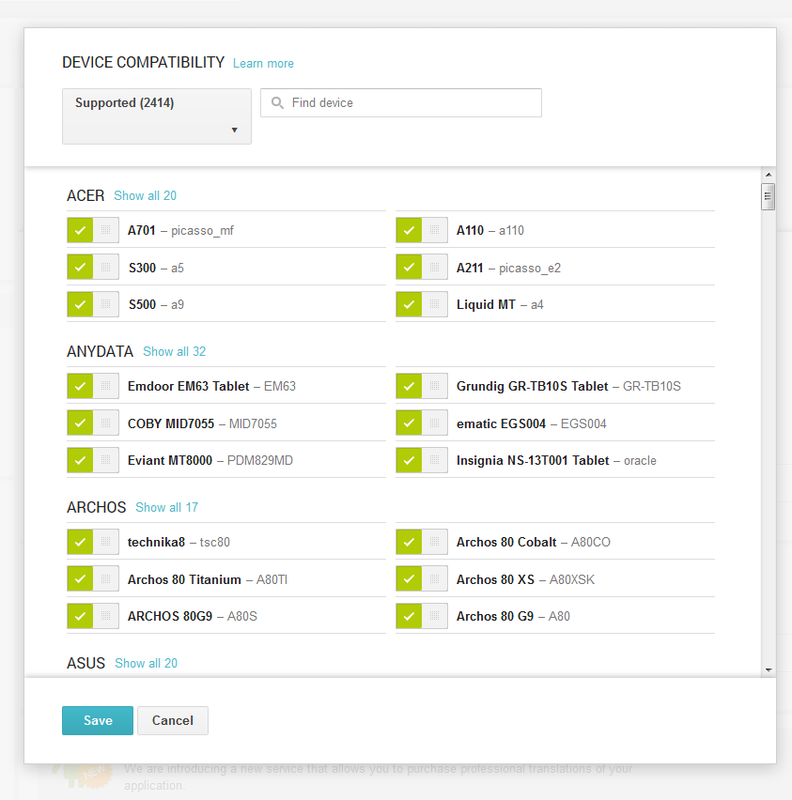 The full list of settings is on the Android-Developer-Site. Q: What happens if I don’t add “android:required=”true”” to a specific line? The GooglePlay-store will assume that that feature is required. Q: So all this stuff happens on its own? I don’t really have to do this entire procedure? It appears so. The file is generated and included automatically. Q: Then why are you writing this? So all this information is in one place, which until now it wasn’t. Also I’m a nice person. The lovely Remy Unmensch just published here first book. It’s now on Amazon, ready for your Kindle.